Reamers from TAKEZAWA-SEIKI move your company’s honing process forward. 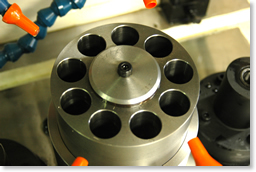 Super Finishing starts with processing prepared holes. The processing of prepared holes is highly significant for the honing process of hydraulic and engine cylinder surfaces, for which ultrahigh precision is required. The materials, precision, compatibility with the quality of materials used in the tools, and the machining allowance must all be considered with elaborate process designing; otherwise, processing with ultrahigh precision would be impossible. With more than 25 years of experience and accumulated data, TAKEZAWA-SEIKI proposes optimized process designs for the entire bore processing. It is not about adapting to the available tools, but rather designing tools that are most appropriate for the process. The requirements for bore processing vary from one customer to another. TAKEZAWA-SEIKI proposes optimized processes for each customer and offers the best design for each individual tool, in accordance with the requirements of a customer. The term “reamer” is just one word but it is not a simple matter, as selected arrangements of abrasive grains vary and must be chosen on the basis of work materials and precision requirements. 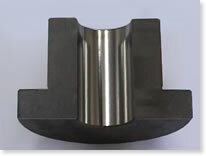 TAKEZAWA-SEIKI designs reamer shapes considering various conditions such as the shape of the workpiece, expulsion of chips, and permeability of the cutting oil. Reamers, which are capable of adapting to step bores and angular holes, are designed to suite the environmental usage of each customer. The process designs of TAKEZAWA-SEIKI can bring about the best productivity and reamers suitable for processes, work materials, and the shape of a workpiece. 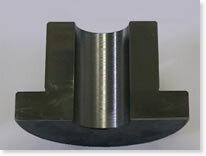 A roundness of 0.5μm and a surface roughness of 0.5S are realized with the Single-Pass Method. The reamers from TAKEZAWA-SEIKI use a single-pass method that allows them to complete processing in one roundtrip (a single pass). Super finishing is possible for not only cast iron and chrome molybdenum steel but also difficult-to-polish materials such as stainless steel. Super finishing that achieves a maximum roundness of 0.5 μm and a surface roughness of 0.5 S is possible (*). Using the single-pass method with TAKEZAWA-SEIKI reamers shortens the conventional honing process, increasing finishing process efficiency and reducing costs for customers owing to the shortened lead time. 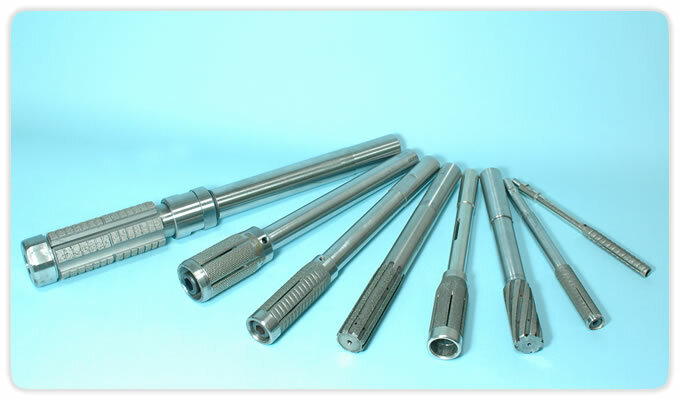 *To increase the accuracy to a roundness of 0.5 μm and a surface roughness of 0.5 S, it is necessary to use reamers with different granularities and perform the single-pass method multiple times. The reamers from TAKEZAWA-SEIKI are electrodeposited abrasive grain reamers with the electrodeposition of diamonds or borazon CBN materials. A countless number of electrodeposited abrasive grains are used to grind a workpiece, thereby reducing the cutting resistance of each individual abrasive grain, enabling us to achieve extremely precise machining accuracy in a stable manner. Furthermore, exceptionally precise polishing with a Single-Pass is possible due to of the extremely high material extraction rates of diamond and borazon CBN materials used as abrasive grains. The tool life is improved by 400%, reducing the tool costs. 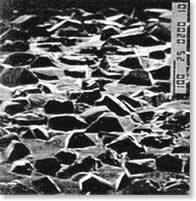 Tools made of diamonds and borazon CBN generally have a long life, since they are four times more abrasive resistant than common grinding stones. The tool life is further improved by 400% by the proprietary expansion function of TAKEZAWA-SEIKI. Tools with abrasive grains electrodeposited on the surface, which no longer satisfy the tolerance range because of wear, are at the end of their tool life. However, this is not the life span of abrasive grains. 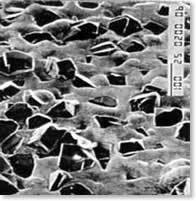 Despite the reduction in the size of abrasive grains due to friction, the cutting force itself does not change. The diameter of reamers from TAKEZAWA-SEIKI can be finely adjusted by a simple operation. The reduction in the diameter of abrasive grains due to friction can be compensated by extending the diameter of the reamer itself, thereby extending the life of the abrasive grains to its maximum limit. This results in an additional 400% improvement of reamers with diamond and borazon CBN materials, which have a very long life. * Figures may vary depending on machining conditions. * Comparison data of our products. Reamers from TAKEZAWA-SEIKI are compatible with various work materials. It is possible to control durability, machinability, and the machining accuracy of the electrodeposited reamers through a selection of arrangements and concentrations of abrasive grains. TAKEZAWA-SEIKI has been collecting data for over 30 years relating to the combinations of various work materials and precision requirements, as well as optimum combinations of abrasive grains and their arrangements. Reamers designed for a customer are tested under their environmental usage to verify that they fully satisfy the requirements before being delivered to the customer. New customers are invited to inquire with a peace of mind; TAKEZAWA-SEIKI will respond responsibly in order to improve the production efficiency of finishing processes. The best reamers matching the requirements of each customer will be provided. Complete design controls over the shape of a substantial line of products. 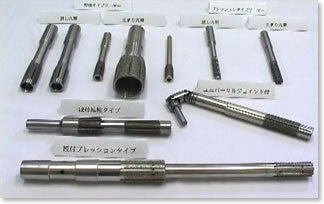 TAKEZAWA-SEIKI, which is also a machining company, is capable of designing and fabricating reamers with various shapes on demand, as required by its customers. TAKEZAWA-SEIKI can significantly advance the productivity of inefficient processes, in which previous reamer processing was difficult, through the proposal of reamers with a shape that matches the requirements of a customer, not only for through bores but also for the reaming of blind bores, or reamers with universal joints and even reamers intended for step bores. There is still room for improvements in the efficiency of the finishing processes. Reamers from TAKEZAWA-SEIKI can shorten the lead time process with Single-Pass processing. This not only provides customers a reduction in the investment costs of tools with a very long tool life, but also helps them achieve a reduction in machine downtime due to the replacement of tools. This improves by leaps and bounds the production efficiency of finishing processes and contributes to a significant reduction in costs.